Tuesday, January 19, 2016, 1915 Hrs. 50 degrees, partly cloudy and light wind. This morning I woke up bit chilly and mostly cloudy at 44 degree. Yikes still! About 10 this morning Beth texted me while I am taking a home bath, I responded to her after I got dressed. We started talking about hooking up the 2nd (red) inverter to get it connected to the solar panel battery. So much confusion going on messaging to each other back and forth, I found so much she mentioned not really working to get it connected. And she was very slow to respond to my texts and hundreds of photos. I finally got the picture of what she was talking about by mentioning about using the straight wires without eyelets by using bolts, washers and nuts on the battery. Nuts! After switching the silver inverter with the new cables, no power at all! I switched it back and got full good power, she again try to have me to disconnect the cable from solars and re-try it again, once again, it failed. I heard a thunder rumbling and it started to rain at that time. I knew it was gonna rain today! Hmmm, I told her that the “new” cable that she wanted to me to use instead of the clamps is thinner than the original clamp cable. 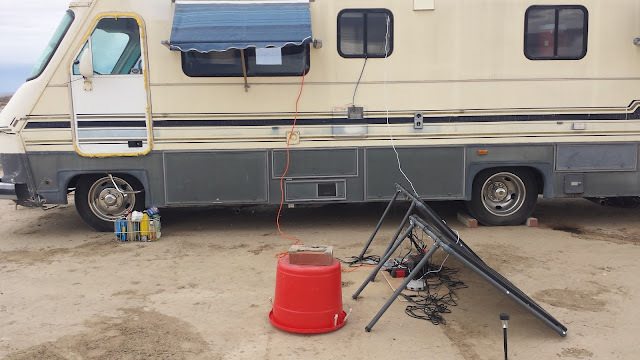 So she told me to go ahead and use my ideas, so I again switched it around back the old way and use clamps on the red inverter and finally both of the inverters work. And then I tested the red inverter with the extension cord going into the RV with my cell charger and laptops plugged in and it’s works! I then covered that red bucket and put a brick on it and find I needed a square bucket to cover the whole thing instead of a round bucket. Shortly after that more rain came pouring down. I stayed inside for the duration of the good rain. Now I got mad that an hour after the rain pouring down from the sky, the front unit start to leak AGAIN!! GRRR!! After I put 2 coats of cement around the unit and it still leaks, that’s really upsetting me. So after the rain stopped, I went up to the roof again to squeeze the standing water out of the roof to slow down the leaks. Rain down poured from southwest that may have caused it to enter the front unit vent holes. I still need to do something about that with aluminum tape, therefore I need to ask anyone who can donate a roll it would help! Please call Beth at 714 699-3323 with how you can help. I also found that the printer and coffee maker don’t work on the solar power, but I will now cut down the generator running and only will run it when I need coffee and printing shipping labels from eBay Store. Yes, Coffee maker is not always coffee, but hot water for my shaving and bath when it’s windy and raining. At about 5:15 pm today, instead of using generator, I had a hard time to get solo-stove to fired up so I could have hot beef stew (No, my body don’t like eating cold food on cold days!). Normally I can get solo-stove fired up and ready-to-eat within 10 minutes, but this time, due to wetness and wind, I finally got my meal cooked and ready-to-eat in about an hour! I had to light it up 12 times to get a fire going with lots of cotton balls! Yikes, 11 matches wasted! For tomorrow, I need to clear up wet mud again and see if I can get our “yard” clean up and look for more woods around. It supposed to be a clearer day tomorrow with light wind, I just hope! I am calling it for the night!